By launching Kwid, Renault has created a history with its very affordable pricing ( INR 2.56 Lakhs for base variant). Renault Kwid‘s SUVish design is inspired by Renault Duster – the company’s popular compact SUV which entered India quite sometime back and validated the SUV market in India. Seeing the huge potential in Indian automotive market, companies are investing more on research and are bringing the cars which are well crafted for Indians. After Kwid, we can now expect other SUVish looking hatchbacks in India in coming days. Mahindra XUV100 is the car which we are talking about. 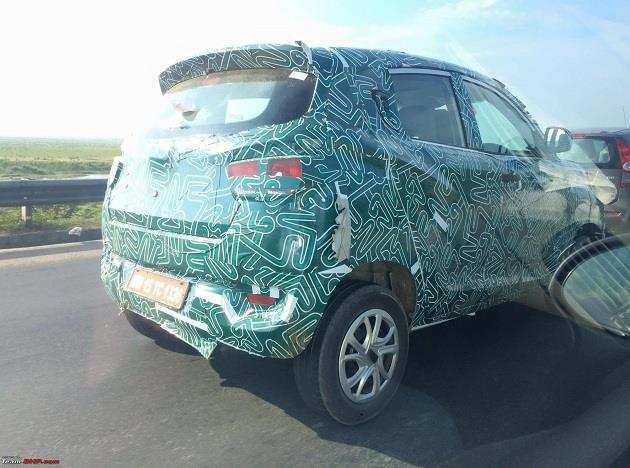 Internally code-named as Mahindra S101, the car is rumoured to get a sticker of “XUV100 or XUV 100 or XUV1OO”. The hatchback XUV100 has been spied several times while testing on Indian and has been reported by readers of Team-Bhp. The all new Mahindra XUV100, which is a hatchback / compact SUV is the 2nd product from Mahindra to be designed on new monocoque platform. The spied XUV100, features a cab-forward design and also resembles a bit of XUV 500 design in the front. When it comes to interiors, the XUV100 would get all-new interior design with contemporary dashboard with piano black treatment, leather upholstery, and silver accents on steering wheel, centre console and instrument binnacle. Talking about the features of Mahindra XUV100, the car features high-mounted AC vents, an audio system and chrome accented vertically stacked knobs and gear lever on the centre console. Unlike Mahindra XUV500, the Mahindra XUV100 features a speedometer dial on right side. The car is come with six seat configuration. The other features of Mahindra XUV100 includes an infotainment system, touchscreen display, a multi-function steering wheel, automatic climate control, ABS (anti-lock braking system) with EBD (electronic brake-force distribution) and ESP (electronic stability program) will also be on offer. The Mahindra XUV 100 is expected to be powered by 1.2 litre petrol as well as the diesel engine. Reports reveal that the 1.2 litre petrol engine is going to be developed jointly by Mahindra and Ssangyong. Just like Mahindra TUV300, the engine would be mated to a 5 speed manual transmission and AMT (automated manual transmission) transmission. The car’s 2WD (two wheel drive) system would come as standard feature. We have no clue on details of engine which is used in XUV100. If the XUV100 is powered by 1.2 litre engine – expect the car to deliver the fuel efficiency of around 20 Kmpl. The entry level car segment is also becoming quite competitive in India – the launch of Kwid in a very affordable price tag has kept the game on. The company might price the Mahindra XUV100 the SUVish looking hatchback around Rs. 4 lakhs for the base variant and Rs. 6.5 lakhs for the top-model. Going by its looks – the car doesn’t look like SUV and looks like a hatchback with somewhat SUV design.